The founder and chief executive of the charity The Kiltwalk has resigned and the organisation is undergoing a restructure amid concerns about the amount of funds that it passes on to good causes. 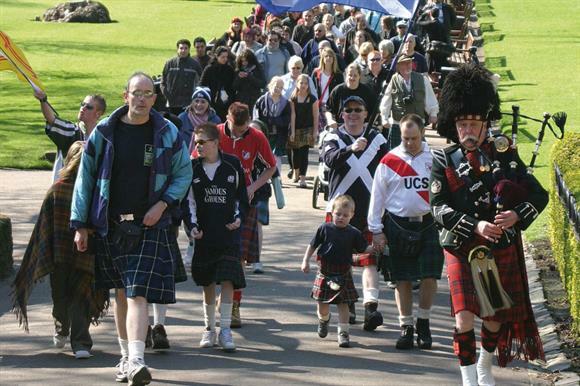 The Kiltwalk, which was founded by Carey McEvoy in 2011, organises sponsored walks with people wearing kilts to raise funds for children’s charities in Scotland. Four charities – the Sick Kids Friends Foundation, Cash for Kids, Aberlour and Clic Sargent – have all recently cut ties with the charity, with the last two citing concerns about the amount of funds they received from the events. Of the £1.6m income The Kiltwalk had in 2013, £776,406 went to participating charities. A statement from the charity yesterday said it was in a "time of some uncertainty" and the past few weeks had been incredibly difficult. The statement said McEvoy would leave and the charity would undergo a restructure, which might affect five of its 14 staff. "In order to ensure the event not only survives but also prospers, we have reviewed all forms of expenditure," the statement said. "There are many areas where it is difficult to substantially cut costs – for example, in the extra resources we have invested in health and safety measures around each Kiltwalk event. "But there are areas we can improve upon. Therefore, in order to protect the organisation, the board is working on a programme to restructure in order to cut overheads. Certain aspects of the events will need to be scaled back, but centralised costs – including staff – will also be affected." McEvoy left the charity yesterday. The Kiltwalk said it could not comment on the financial terms of his departure or whether he had received a pay-off. In the charity’s statement, McEvoy said: "The past month has been very difficult for the whole team, with four charities withdrawing as partners followed by several stories in the press, all of which are having a big impact on our 2015 events. "However, the charities leaving and the resulting media coverage have happened on my watch. We need to fully restore confidence amongst fellow charities, partners and walkers and I believe fresh leadership of The Kiltwalk can help to achieve that aim." Mhairi Pearson, head of marketing and fundraising at The Kiltwalk, said: "Over the coming months we are refocusing on the core of what makes The Kiltwalk special: the walkers and the thousands of children we support every year. "We hope it’s the beginning of a wonderful future organising fantastic events as a way of raising crucial funds for those charities doing extraordinary work for Scotland’s children. "In order to do this, we need the support of the third sector so The Kiltwalk can be a unique fundraising platform designed to help charities of all sizes."